New Dances 2017 marks the end of an incredible era of dance creation supported by Thodos Dance Chicago. The project aims to provide up and coming choreographers a chance to bring their fully realized visions to the stage. Additionally, dance creators are given the opportunity to receive feedback on their works in progress from distinguished members of the Chicago dance community. Take a look inside the studio with choreographer Brennen Renteria as he mounts his second contribution to the New Dances project series. Brennen is constantly seeking ways to solve his choreographic conundrums. New Dances provides dance creators with the unique opportunity to receive feedback from an esteemed panel of established dance professionals. This year’s panel includes Kristina Isabelle, Margi Cole, Zac Whittenburg, and Billy Siegenfeld. Choreographers participate in two showings with the panel, which provides insight and advice to help the choreographers realize their vision. 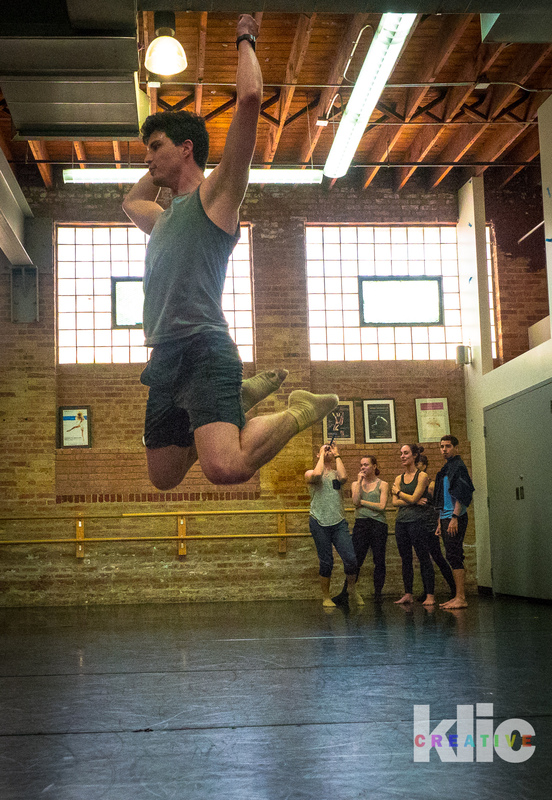 Photographed above is Brennen and his brother, Aaron Renteria (Joffrey Ballet) rehearsing a salsa step. Brennen is pulling from his own experience as a professional ballroom instructor to create the movement language for his piece. The New Dances project series serves as a movement laboratory for choreographers and dancers, granting them rehearsal space inside of the Drucker Center’s North Studio at Menomonee Club for Boys and Girls in Lincoln Park. Although Aaron and the other dancers in the cast have many years of classical dance training, learning the nuances of these social dances is proving to be an exciting challenge! New Dances brings together dance artists from its parent company, Thodos Dance Chicago, with artists from the greater Chicago area and beyond. This photo of dancers Kasha Hilton and John Cartwright shows Brennen’s choreography in its early development stages. Integral to the choreographic process are the dancers in the cast – they provide inspiration and serve as vessels for movement experimentation. Although Brennen is in the opening stages of creating his work for New Dances 2017, it is abundantly clear that the social dance influence will create dynamic and emotional partnerships between the dancers. There is something magical about bridging the gap between the world of concert dance and social dance, which Brennen intends to use as a vehicle for his story. Above, dancers Hailey Meert and Carson VonFeldt (both former interns for Thodos Dance Chicago) work through their opening pas de deux. New Dances 2017 will take stage at the Athenaeum Theatre July 15 + 16. To learn more about New Dances 2017, visit Thodos Dance Chicago.